Kathal (Jackfruit) Kofta: Sustainability shouldn’t hurt – What is Curry? Tropical climates give way to a tree that bears both vegetable and fruit, known by many names: breadfruit, jackfruit, kathal. A fruit when it’s ripe and is treated as a vegetable before that. These grow to be quite huge and a jackfruit tree is quite a sight especially after monsoons. You can see jackfruit in many forms When ripe, it’s aroma is tantalizing paired with an interior that ranges from yellow to a deep red, indicating it’s sweetness level. Whether yellow or red, one of the things in common different species of jackfruit have is that they require very little water to bear the gigantic fruit which make it very low cost and accessible to produce. It’s a hefty fruit in minerals, phyto-nutrients, vitamins as well as macros. Studies have shown a huge boost in immunity, skin, and hair care which is really needed for communities of people who rely on it as a prominent food source. Some of my favorite folklore growing up centered around the mystical nature of the moonlike seeds posited by its fruit. I remember looking at the glistening pits of my first jackfruit wondering what kind of mystical powers it possessed. 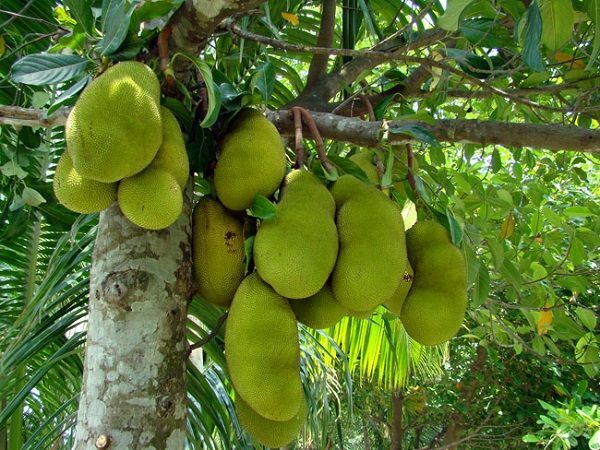 Decades later I realize it was less in appearance but more in the nutrients and access jackfruit has provided all over regions of south Asia, east Indies, and East Africa which still mystify me. One of my favorite stories centered Jaanki, a young girl who aspired to help her family in poverty but couldn’t do “manly” tasks such as chopping wood or mining. She fret as the financial situation for them became worse and her mother took very ill. One stormy night, after running errands she becomes lost, fearing for the worst. But as she feels her lowest, glinting in the moonlight she sees what she thinks is a shiny rock. Hurrying towards it, she looks up and can sees the massive fruit – a ray of hope. Almost as if the storm was an excuse, it clears and she is able to make her way home clutching the pit to show her family. They rejoice, as the jackfruit represents many streams of income from selling the fruit to using its wood as furniture. Things begin to look up, even sustainable. But unfortunately, greed begins to grow in the brother’s mind. The price of furniture is much more profitable than selling fruit. And to Jaanki’s dismay, when she goes to the grove one day, all of the trees had been chopped. Much like the brother, western and eurocentric gazes have also been on jackfruit and unlike the protagonist, they aren’t concerned about jackfruit’s link with community but the uses that it can be mass produced into providing, a constant cycle of neoliberalism. I’m already apprehensive as the western world has already started to exploit this resource and I wonder what the inflation costs back home will result both for farmers and consumers. Saw it at Trader Joe’s for $1.99 a can, I don’t think they realize how much they’re overcharging. Somehow the bullying of our food turned into a profit turning fetishization for our cultural treasures which continue to be stolen without acknowledging its origins or a ethical consumption that pays the people it steals from. I ended up going to an Indian grocery store to dive into the nostalgia of this kathal kofta recipe to hold off the sadness I feel of my favorite foods being colonized all over again. A lot of western recipes are centered on using jackfruit as some cheap meat knockoff but this recipe is centered around accentuating the textures and flavors making kathal the star it is! Kofta is used to describe a type of stewed dumpling that can be made with meat or vegetables. This recipe becomes vegan with the help of jackfruit and potato with a hint of gram flour. You float these delights in an earthy onion tomato base and it’s an absolute delight over cauli rice. Lots of heat packed spices like cloves, black cardamom, and ginger make it suitable for cold winter nights! Chop chilies, and cilantro for later. Grind garlic and ginger into a paste. Grind onion into paste. There’s two components to this dish that if done in tandem, make your cooking time a lot shorter! The masala of sauce and the Kofta or dumplings. Start the dumplings first as we will have to steam and prepare the filling, fry and bake it, then finally simmer it in our masala. Most people lie about how long it takes to caramelize onions, it takes a good while (probably why I end up getting buffer when I’m cooking a lot haha). With white onions, the paste looks translucent until it takes on a light brown color. Salt will also help sweat them out, making caramelization faster. In a separate container, I added all of the masala along with some water to make a sort of paste. This helps the spices from burning. Add in the garlic and ginger paste along with the masala paste, once again stir stir stir! Your kitchen will be quite fragrant and a good indicator to drop in the puréed tomatoes. Cover and let it simmer until the tomatoes go from a pale pink-red to making the gravy a beautiful warm brown. This takes 8-10 minutes. Add cilantro when brown. For this recipe, we’re using canned jackfruit as its more readily available/takes less time to cook. We will steam it in some warm water and little bit of lemon to take away the briney “canned” taste. This should take 5-10mins. Once you’ve drained all the excess liquid. Pat down any leftover moisture and begin to shred it with a fork or any other utensil you find comfortable. For the filling, I only like to add 1 medium sized potato to hold it together along with a tablespoon of besan (chickpea flour). It does have a faint nutty flavor but since I grew up with it, I love how it accentuates any dish but if you don’t have any available or simply not a fan of the flavor, you can swap it out with regular flour. Set your oven to preheat at 400 at this time. Add all toppings and start taking small handfuls and balling them within the palms of your hands. I press down slightly as perfect spheres take longer to cook. Heat your oil on medium high. To check, I usually sprinkle a little bit of flour and if it rises to the top quickly without burning, it’s ready! Drop in the Kofta, being careful to turn them quickly. Once they’re browned, take them out and pop them into the oven. Leave them in for 20-30 minutes depending on the size of your kofta.